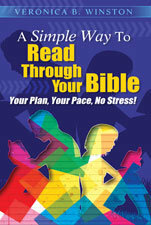 A SIMPLE WAY TO READ THROUGH YOUR BIBLE YOUR PLAN, YOUR PACE, NO STRESS! Enjoy getting to know God and His Word with Dr. Veronica Winston’s simple, easy-to-follow, no-pressure Bible reading plan. A brief outline and summary for each book in the Bible are included plus a free recording chart to track your progress.